There’s something about a huge video screen. 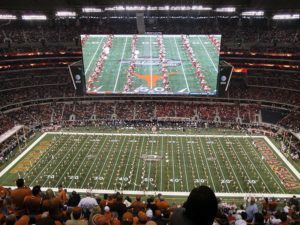 Sports bars trumpet about their 180” screens, IMAX has always made a big deal about it, and they made the screen at Texas’ AT&T stadium so enormous that punters have hit it! Seriously, that screen is almost unfathomably large. Each of the 2 larger screens in the 4-sided display are 160’ wide, weigh 1.2 million pounds and use 635,000 watts of power to run! Obviously you’d have to put a screen that big in your back yard. It would never fit in the house…. Seriously though, there is something compelling about a large screen, especially for sports and movies. It’s not all about bringing you right into the action, either; although it certainly does that! A large screen conveys subtlety, detail and emotion you just flat miss on a smaller screen. As with everything else electronic, large screen displays and other companion technologies have made significant advancements recently. More 4K projectors are ready to take on 4K and HDR streaming content from Netflix and Amazon. Also, disc based 4k, ala 4k UHD Blu Ray is steadily gaining ground. For large format displays you’ve got two choices: 2-piece projector / screen combinations or a large flat panel. Projector/screen combos deliver the largest images, going from about 72” diagonal to “How big do you want?” Flat panel displays top out at about 90in. Projectors once got a bad rap for being not as clear as a regular TV, but anyone who’s seen a good one in that last 20 years likely has a different opinion. They deliver stunning clarity, rich colors, and immense images. It’s a hard combination to beat. For those who enjoy larger, brighter images and would like near-infinite lamp life, lasers are slowly making their way into the projection realm. Rich colors and tack sharp images are the norm here, natch! There’s one more place projectors rule; black bar elimination. Would you love to get rid of those black bars that eat 1/3 of your picture when watching wide-screen movies? Yeah, it’s pretty cool. Projectors can use a pretty neat piece of kit (as the British car guys say) to make the wide screen image wider and the black bars a think of the past. It’s called an anamorphic lens, but don’t worry about pronouncing it. Just tell us you want to get rid of the black bars, and we’ll see if it can work for you. While projection systems are unbeatable for bringing home the theater or sports bar experience to your home, it’s not as simple as hanging a screen on the wall and nailing a projector to the ceiling. They are more technical and application specific than a flat panel display. Working out best screen material for your application, the proper sight lines, and image size for your seating area is important to bring you the best experience. We’ll be happy to figure out the details for you. A projection system may not be the best combination for your application. If not, you’ll be overjoyed to see the kind of picture quality the latest flat panel displays give you. Some new picture technologies deliver better color and a richer image than ever before, and they’re starting to make their way into more and more sets now. TVs are thinner now, too, and a better value than ever before. There are also new mounting options that keep the TV close to the wall for a more streamlined appearance. Your designer will love it! If the aforementioned sports bar is something that’s been burning a hole in your psyche lately, you’re in luck! There are some super cool video options that can make your sports bar rival anything at the mall or downtown. You can combine multiple screens into a huge image, or show multiple games at once. Your imagination’s the only limit. Of course, no matter how insane your setup, we’ll give you a remote that makes it a breeze to use for anyone from 8 to 80. Disc based content does offer more compelling audio and video in most cases than does streaming from. There is simply more room to put data. The downside is that 4k Blu Ray content is just getting started, having made its debut in the last year. There are roughly 150 UHD Blu Ray movies available now, with many more on the way. Since there are no competing UHD disc formats (it’s about time!!) there won’t be the problems other formats had when they were introduced. Remember HD-DVD vs BluRay or VHS vs Beta? media set-up for the home or corporate setting. We are an Authorized Control4 Dealer and offer complete solutions that include home theaters, whole house audio/video, surveillance, lighting, automation, digital living, remodels and room conversions. Find out more at www.tekmaxtechnologies.com and “Like Us” on Facebook and follow us on Twitter.